Good Shoulder exercises combine those that work to stretch, strengthen, and stabilize the shoulder girdle, while working all of the muscles of the anterior and posterior shoulder complex. This shoulder stretching exercise not only stretches the tricep muscles in the front arm, but also the anterior shoulder and a rotator cuff muscles in the arm reaching back. 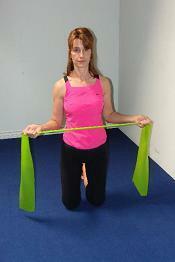 You can use a flexible stretch band as shown, or a towel. Begin standing or sitting tall. Throw the band over your shoulder, holding one end, reach the other arm around your back trying to walk your hands as close together as you can get. Begin to pull the band opposite directions with each hand, creating a tug of war feeling. Hold and release for 4-6 repetitions on each side. This exercise with the stretch band not only opens the chest and anterior shoulder complex but it simultaneously works to stabilize the shoulder blades on your back. Begin lying on your back with arms over your chest and a little tension on the band. Inhale as you pull on the band reaching your hands apart and band across your chest. You will feel your shoulder blades draw together in the back. Exhale as you slowly release the tension back up to start. Check out this page for some good shoulder exercises for women. This shoulder exercise is good for stability and can be done with or without a ball. The exercise ball adds a little more challenge as it causes you to balance both sides of your back and shoulder muscles equally with the instability of the ball. Walk out on the ball to a plank position as shown. Hands should be directly under your shoulders with the chest wide. Feel your shoulder blades wide and engaged on your back. Feel lifted up through the back of your head and upper back and squeeze your inner thighs together. Hold for a few breath cycles and then walk out again for 3-5 repetitions. Find more ball exercises to help with your core and stability here. You can't think about working the shoulder without doing some good rotator cuff exercises using internal and external shoulder rotation. 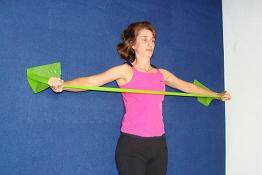 Use the exercise band for external rotation as shown here at the left and with your palms up. Inhale as you tension the band pulling your hands out to the side keeping your elbows near your waist. Exhale to slowly release the tension. You will feel the work in the back side of your shoulder or cuff and the stretch is in the front across your chest. Repeat up to 10 repetitions. Internal rotation as shown to the right. Keeping tension on the band with one hand draw the other arm across your waist in front. You will feel the work in the front or anterior side of the shoulder and the stretch across the back of the shoulder. 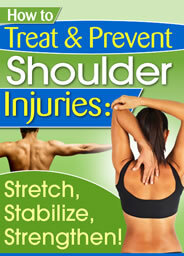 Leave good shoulder exercises and find more ways to stretch, strengthen, and stabilize your shoulders here.